When George H.W. Bush was elected president, City on a Hill Press blacked out the cover. Tuesday night — nearly 30 years later — we were tempted to do the same. But the community, our community, can speak for itself, so we decided against it. This is dedicated to those who are hurting, those most suppressed and those who will rise up to fight another day. Donald Trump’s election is nothing less than a catastrophe. Tuesday night we were ashamed to be American, but today we are proud to be UC Santa Cruz students. A Donald Trump presidency is a backlash of racist, homophobic and misogynistic values that America was founded on that are again bubbling to the surface. It was difficult to watch 18 months of praise for these values, and it was even more difficult to see it culminate in Tuesday’s election. We are deeply saddened and troubled by this turn of events and hope that for the next four years we can look within our own communities for support, love and resistance. We will be with you every step of the way. Keep fighting. 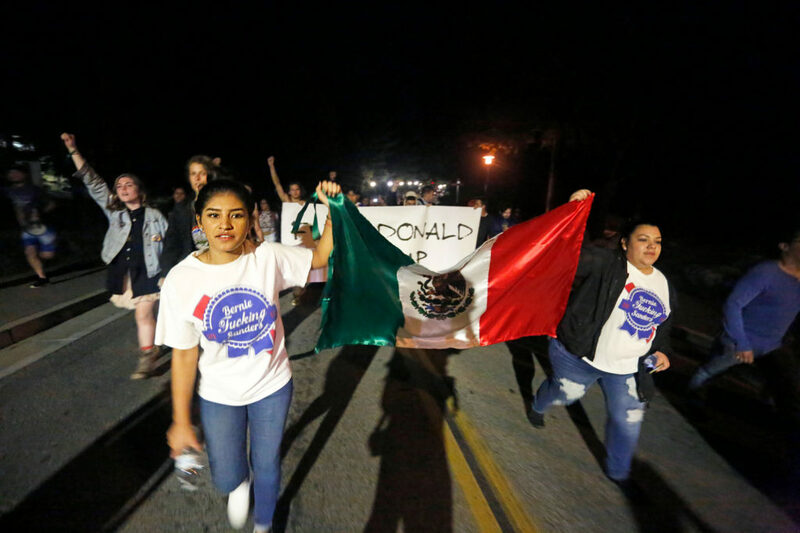 As many as 2,000 students marched across campus Tuesday night in response to Donald Trump’s presidential win. The group originally started with around 20 students gathered in College Nine and increased as the march visited each residential college. 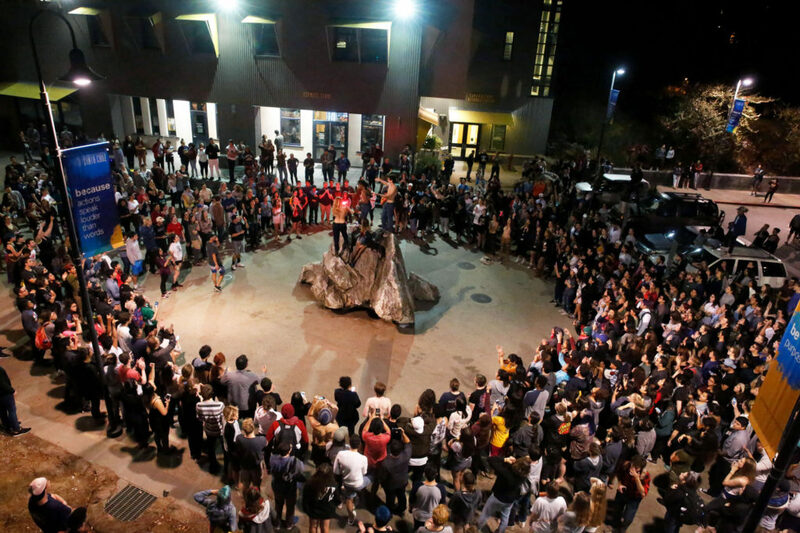 Students gathered in Quarry Plaza in peaceful protest where they spoke about their opposition and fears regarding the Trump presidency. 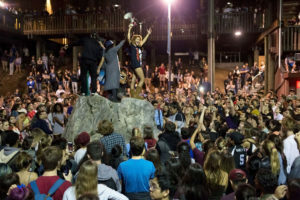 No arrests were made and no one was hurt, said UCSC Police Chief Nader Oweis. 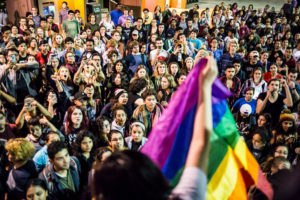 Both Chancellor George Blumenthal and UC President Janet Napolitano have issued statements recognizing the severity of the political climate. “When you aren’t around people of color, when you aren’t around people that are different than you, then it’s so easy to let ignorance and nearsightedness cloud your humanity. I think that’s what’s going on right now” Kavya Aswadhati, first year. “Not only have we elected Donald Trump for the presidency, but we’ve also elected a House and a Senate of Republican majority. That Republican controlled executive and legislative branch will appoint a Republican controlled judicial branch. 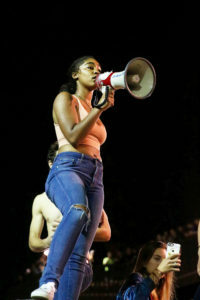 We’re going to be set off the path of progress we’ve put ourselves on over the past few years, over the last few decades,” Wayne Ledgister, third-year. “It’s about uplifting the voices of those who are silenced because I’ve been there. People have told me to shut up, people have spoken for me, and I don’t want to do that to someone else. I want to make sure that, yeah I’m queer, yeah I’m a woman, yeah I’m brown — so what? I finally built that confidence and I want others like me to get up there and find that confidence,” Maxine “Max” Jimenez, second-year.